Heat oven to 400 degrees F. Place pie shell on a cookie sheet. In a large mixing bowl, whisk together sour cream, granulated sugar, 1/4 cup all-purpose flour, vanilla, cinnamon and ginger until well combined; stir in peaches until combined. Pour filling into pie shell and bake 15 minutes. In a medium mixing bowl, stir together remaining 1/2 cup flour, pecans, brown sugar, and salt until well combined; knead butter into mixture, using fingertips, until combined and clumped together. Sprinkle evenly over top of pie. Return to oven and bake an additional 25-30 minutes or until golden brown. Cool on a wire rack completely before slicing. Serve warm or chilled. 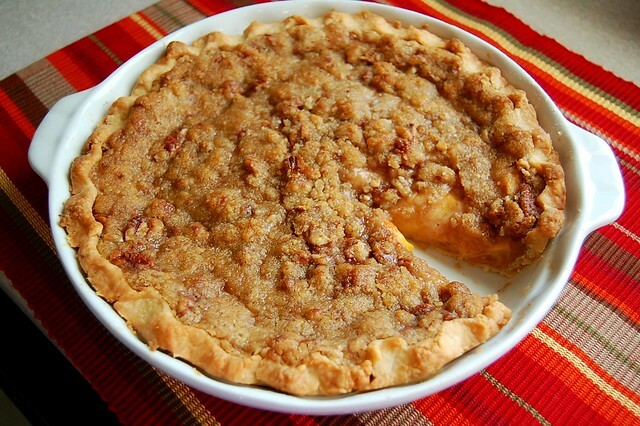 26 comments on "Georgia Peaches 'N Praline Cream Pie"
This sounds amazing and the praline topping is droolworthy:-)...I don't think you can ever be too late for a peach pie! I have to admit, the sour cream in the pie filling sounds a bit weird to me. But I'd definitely try it. 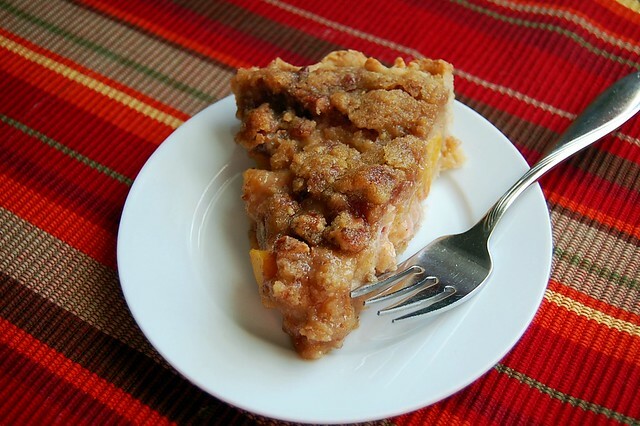 I love peach pie! Oh my goodness I am literally drooling over here! This sounds amazing! My mouth is watering this looks awesome! Wow! 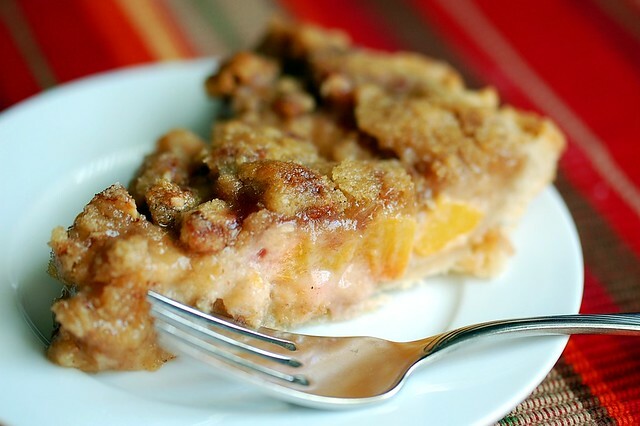 I just bought some peaches yesterday and this pie looks amazing. To bad my boyfriend does'nt like these fruits! Oooh we want we want! That praline topping?! Genius! Oh my goodness that looks so good! Unfortunately, I can't each a peach right off of the tree (raw stone fruit allergy) but I can eat them cooked! 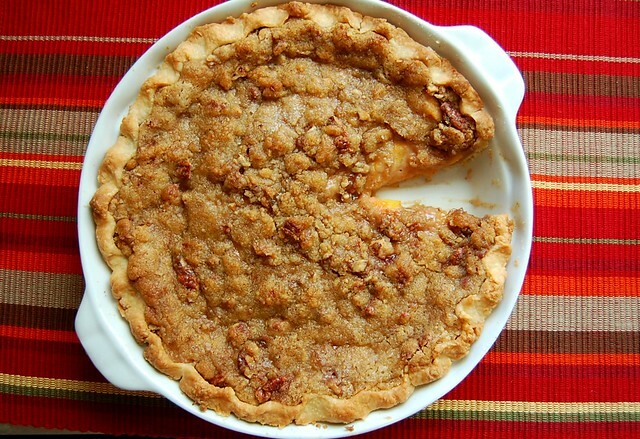 And I want to eat this pie. This pie looks yummy. I have some preaches I need to use and was going to make the peach cobbler you posted recently but I think I might be going with this pie. Thanks for creating and sharing! I made a pie similar to this but with greek yogurt instead of the sour cream! It was super yum. This looks delish!! PS You got me started on Top Chef Desserts...so good! I want a Willy Wonka Wonderland! Mmmm, i love peaches. This looks fantastic! Great! It must soooo sweet and melting in the mouth! Oh, YUM! I wonder if the farmers markets around here still have any peaches. They did the other day. I hope so, because this pie looks fabulous!! That looks so good! A great fall dish! That is a gorgeous delicious looking pie. This pie looks awesome. I would probably want to eat that topping with a spoon. ho. ly. cow. that topping is outstanding, emily--you can see the buttery-ness even in 2D. bravo. YUM. YUM. YUM. YUM. YUM. The pictures are so good and are all warm and delicious looking :-) I accept leftovers! Made your recipe last night. It is superb!!! My husband said it was the best pie he has eaten. 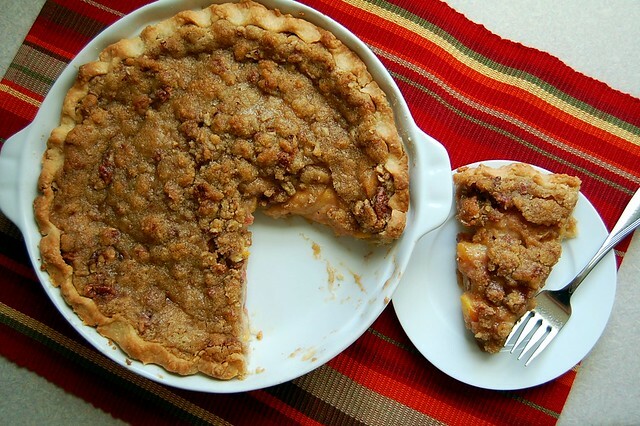 I have a standing rule that all peach pies should have a praline topping and this one rocked! Yum yum yum!!! Thanks for the great recipe.